Next time you come to a stop at a red light, look at the drivers around you. What are they doing? Are their eyes darting from the light to their lap? Are they putting on makeup, eating or talking on the phone? Chances are that they, and maybe even you, are driving distracted. Multi-tasking is a myth. You may think that you can watch a movie, while listening to iTunes, while writing an email, and simultaneously follow the plot, hear the lyrics, and control your run-on sentences, but you can’t. Focusing on more than two things at a time doesn’t just slow you down and increase the number of mistakes you make; it temporarily changes the way your brain works. When you need to focus on performing a task, your frontal cortex springs to action. If you’re asked to perform any more tasks, the brain segments with each added activity. The more you try to do at one time, the higher your chance of failing. And driving a 1-ton vehicle is a task you don’t want to fail. Distracted driving is a public safety hazard. Each day in the U.S., nine lives are lost and 1,153 are injured in distracted driving incidents. In 2009 the President issued an executive order prohibiting federal employees from texting while driving on government business or with government equipment. The government has even taken to the Internet, armed with public safety campaigns dedicated to informing and eradicating distracted driving from our streets. This is not a passing phase — it is an alarming trend that must be eliminated through education and awareness. Talk to the drivers in your life about focusing on the road, and doing their part to curb distracted driving. 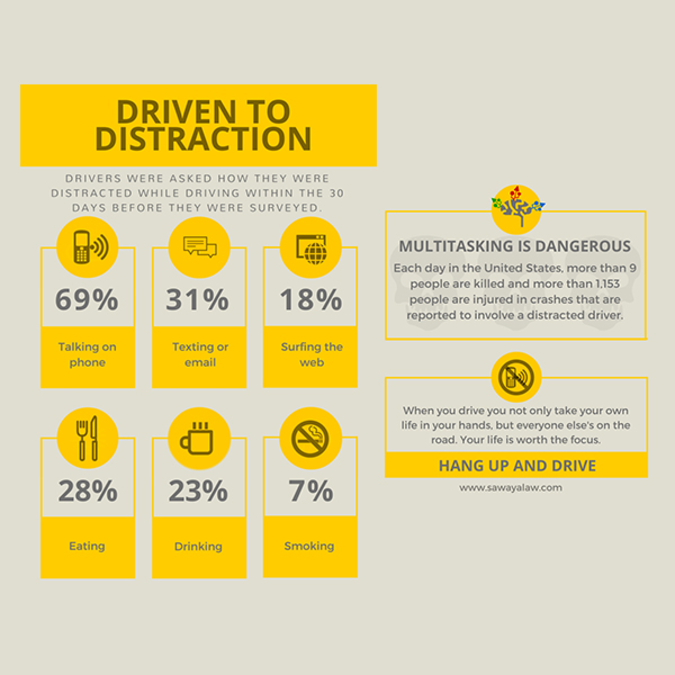 If you have further questions about distracted driving, or if you’ve been in an auto accident involving a distracted driver, call Ed Bernstein & Associates at (702) 240-0000, or visit https://www.edbernstein.com/ .